With proven benefits on your immune system, energy levels and even on collagen synthesis, Vitamin C may not be a miracle cure for the common cold, but it is absolutely one of the safest and most effective nutrients. Vitamin C – or ascorbic acid – is a water-soluble vitamin that is naturally found in some foods, namely citrus fruits. Making sure that you get the recommended daily amount of essential vitamin C in your diet can be a struggle. Vitamin supplements are a convenient way to ensure you meet your RDA. 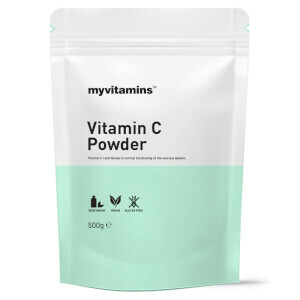 Because swallowing a tablet isn’t always the easiest thing to do, myvitamins range of high-quality formulations includes chewable vitamin C as well a vitamin C powder. Vitamin C Tablets provide your daily dose of this essential vitamin. Added bioflavonoids and rosehip contain polyphenols to help increase vitamin C absorption. 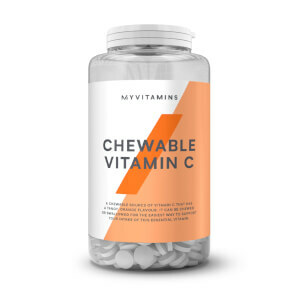 With a delicious orange flavour, myvitamins Chewable Vitamin C are easy-to-take tablets. Just two tablets each day provides 1250% of your RDA. Just 5 grams of Vitamin C Powder provides 800% of your RDA. It is completely tasteless, which makes it perfect for adding into shakes, porridges or other foods.